The two Italian drivers got on track at Vallelunga on the Ferrari F60 Formula One challenger, setting very interesting lap-times which showed once again the skills acquired during the Formula 3 Championship. 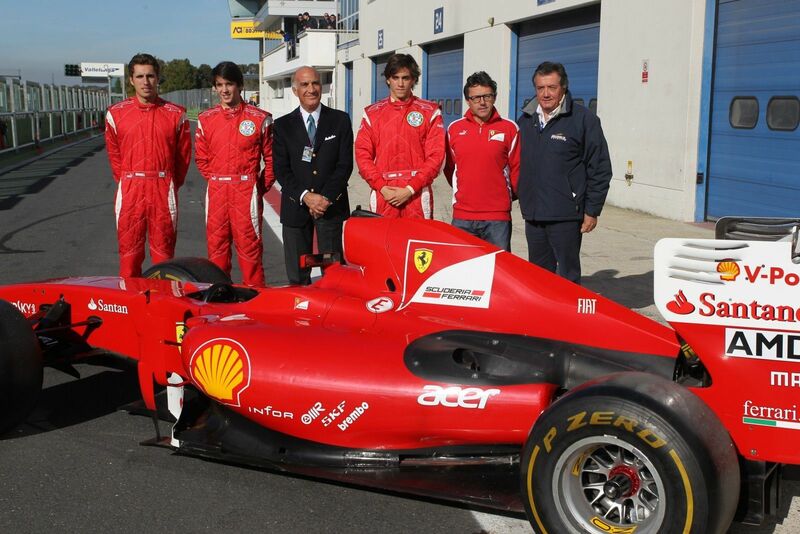 09/11/2012 - This has been an exciting day for Riccardo Agostini and Eddie Cheever Jr. at Vallelunga. The driver from Padova, winner of the rookie title in the Italian Formula 3 European Series and in the Italian Formula 3 Championship and the driver from Rome expressed their potential at the wheel of a Formula One car. Very good were also their times which confirmed the good things done by the two youngsters during 2012 season. Daniel Juncadella, the winner of the Formula 3 Euro Series and of the first FIA European Formula 3 Championship was also on track at the circuit named after Piero Taruffi. Eddie Cheever lived a strong emotion while getting in the cockpit of the F60. The driver from Rome, class 1993 who followed his father's footsteps commented his test in this way: "At the beginning I was a bit nervous, this is a once in a lifetime experience. I hope this can happen more than once actually, but doing it once is already quite a lot for a driver. - continued Cheever - The initial excitement being gone I started to understand better the car and I managed to express my driving in the best way". Riccardo Agostini, eighteen years old from Padova who got his driving licence just a few weeks ago got on track this afternoon showing all is value. Some mechanical problems kept him in the pits for a few minutes but Ferrari's men fixed quickly the F60 and the Italian driver managed to complete his work on the Maranello's car: "It has certainly been a positive experience - said Agostini - and I am quite happy about how things went. The approach to the Ferrari has been very good and I found myselg at ease with engineers and with their work method". Daniel Juncadella confirmed that it has been a very positive test too. The Catalan, more experienced than our drivers set very good laptimes in his run during the morning. The winner of the F3 Euroseries sportively grew up in Italy with Prema Powerteam and admitted that he felt like at home on this track which was confirmed by the pace he set. Positively satisfied about the day was also ACI - CSAI President Angelo Sticchi Damiani who reminded that the collaboration between the Federation and Ferrari Driver Academy gives this young drivers the chance to get their names known as well as to live a memorable experience.